From a leading pediatric sleep physician comes a revolutionary program that will have everyone in the house sleeping through the night. When Dr. Craig Canapari became a father, he realized that all his years of 36-hour hospital shifts didn't even come close to preparing him for the sleep deprivation that comes with parenthood. The difference is that parents don’t get a break— it’s hard to know if there’s a night of uninterrupted sleep anywhere in the foreseeable future. Sleepless nights for kids mean sleepless nights for the rest of the family--and a grumpy group around the breakfast table in the morning. In It's Never Too Late to Sleep Train, Canapari helps parents harness the power of habit to chart a clear path to high-quality sleep for their children. The result is a streamlined two-step sleep training plan that focuses on cues and consequences, the two elements that shape all habits and that take on special importance when it comes to kids’ bedtime routines. Dr. Canapari distills years of clinical research and experience to make sleep training simple and stress-free. 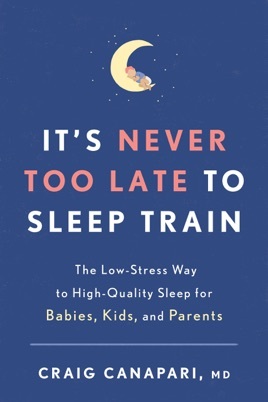 Even if you’ve been told that you’ve missed the optimal "window" for sleep training, Dr. Canapari is here to prove that it's never too late, whether your child is 6 months or 6 years old. He's on your side in the battle against bedtime, and with his advice, parents and children alike can expect a lifetime of healthy sleep.